NASA's Opportunity Mars rover took this self-portrait with its Microscopic Imager in February 2018 to celebrate the 5,000th Martian day of its mission. NASA's Opportunity rover celebrated its 5,000th day on Mars by snapping a first-of-its-kind selfie. 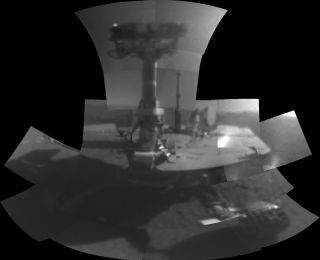 Opportunity has taken photos of itself before, using the panoramic camera on its head-like mast. But the newly released image was captured by Opportunity's Microscopic Imager instrument, which the rover had never turned to take a picture of itself before, according to NASA officials. The photo is a mosaic composed of multiple pictures snapped on sols 5,000 and 5,006 of Opportunity's mission. A sol is a Martian day, which is about 40 minutes longer than an Earth day. Sol 5,000 for the rover corresponded to Feb. 16 here on our planet. The golf-cart-size Opportunity and its twin, Spirit, touched down on Mars in January 2004 and embarked on 90-sol missions to hunt for signs of past water activity on the Red Planet. Both rovers found a lot of such evidence — Spirit even rolled through an ancient hydrothermal site — and just kept on trucking. Spirit kept operating until 2010, and Opportunity remains active today, exploring the rim of a 14-mile-wide (22 kilometers) crater called Endeavour. To date, Opportunity has traveled 28.03 miles (45.12 km) on the Red Planet — more distance than any other vehicle has ever covered on the surface of another world.